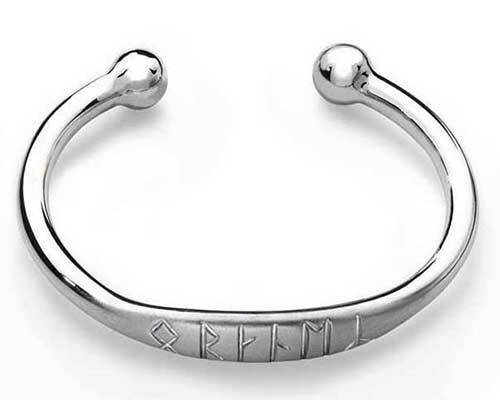 Personalised Silver Runic Bracelet : LOVE2HAVE in the UK! Original Celtic jewellery design painstakingly handcrafted the traditional way this silver Runic bracelet is handmade in the Scottish islands in the UK and is inspired by dramatic seas and landscapes dating back to a heritage of five and a half thousand years ago. Here we have a beautiful solid sterling silver Runic bracelet that we can arrange to be personalised with your very own Rune engraving. The Rune engraving is FREE! as it is included in the price and you may choose up to eight Rune symbols from the Runic alphabet. Just enter your choices into the comments box at check out. The design style itself is a torque or cuff style bracelet made from thick silver wire with a flattened topo where the engraving is carved by hand to your exact requirements. The ends feature silver spheres and the silver comes in a highly polished finish. In regard to wrist size, we can make sure that it fits just right which on average is a 7-inch wrist but if you are not sure please email first and we can advise further. From the early centuries AD, Scandinavian Runes spread with the Viking settlers, and there were strong connections with Runes and folklore. Runic descriptions are thought to have divine protective powers.